Enjoy the serenity of your own private retreat with one of our gorgeous Quebec gazebos. By the pool, in the backyard, or hidden away somewhere special on your property, a Quebec gazebo by Missisquoi Cupolas brings together the beauty of the outdoors with the luxury of a covered, open-air space. From the classic style of the Octagon Gazebo to the simplistic look of the Rectangle Gazebo, our assortment of models is sure to provide you with the look and quality you desire. Here you will find the largest selection of Gazebos in Quebec, Canada. All of our gazebos are designed and built with the highest quality materials and structural longevity in mind. We start each gazebo by using pressure treaded 4”x 4” beams as a base; (however any gazebo may be fixed to a concrete floor). On top of these beams we install 2” x 6” upright floor joists which are then covered with 2” x 6” floor boards. This creates a stable foundation for your gazebo. The posts are then inserted into pre-cut holes, after which rails are added to the posts. 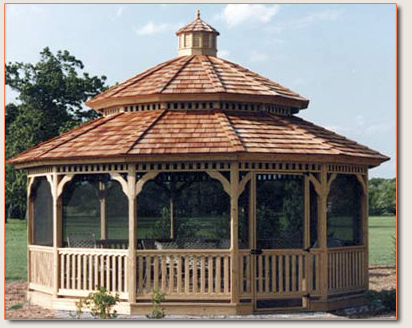 The gazebos are constructed with 2” x 6” rafters and finished with rich red cedar shake shingles. Finally, we anchor the gazebo roof to the posts. This entire process results in a gazebo that you can depend on to endure and enjoy for many years to come. For vinyl gazebos, we use your choice of 30-year architectural shingles. The interior of the gazebo ceiling is then covered in vinyl. This method of construction creates a gazebo roof that looks just as good on the inside as it does on the outside. As well, vinyl gazebos come standard with a composite floor available in 4 different colors that will last a lifetime. There are a number of other ways you can customize your gazebo. From turned balusters, to Victorian-styled braces, to gazebos with double or even triple level roofs, Missisquoi Cupola and Structures can accommodate every style and taste. For more information and pricing on our gazebos, please contact us or come in for a visit and take a tour of our beautiful outdoor showroom. The Pavilion Gazebo is a massively constructed gazebo for the highest traffic use! 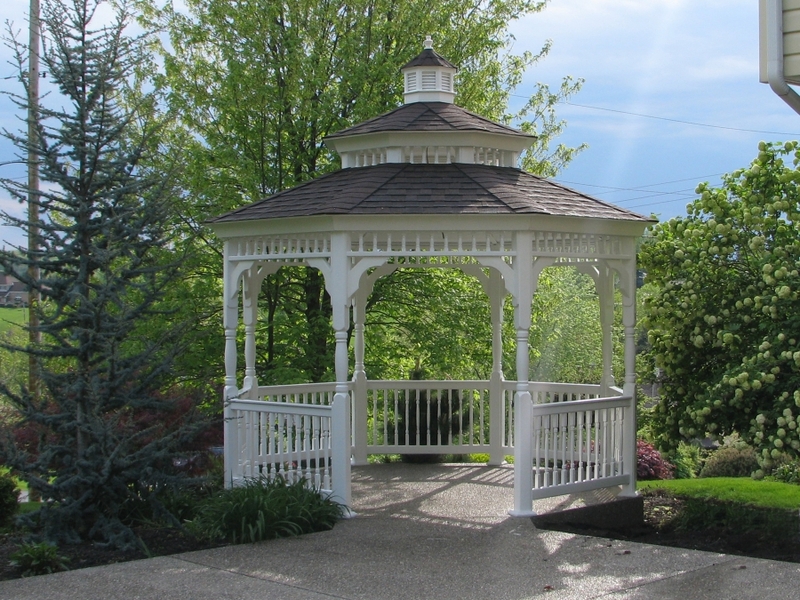 It is the ideal gazebo for municipalities, schools, parks and more. 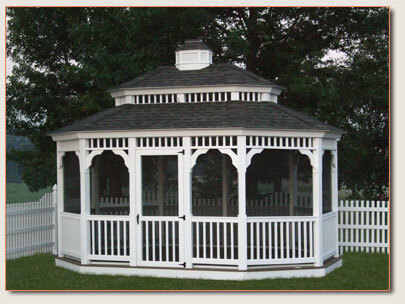 Each of our gazebo styles can be built as a Pavilion gazebo. 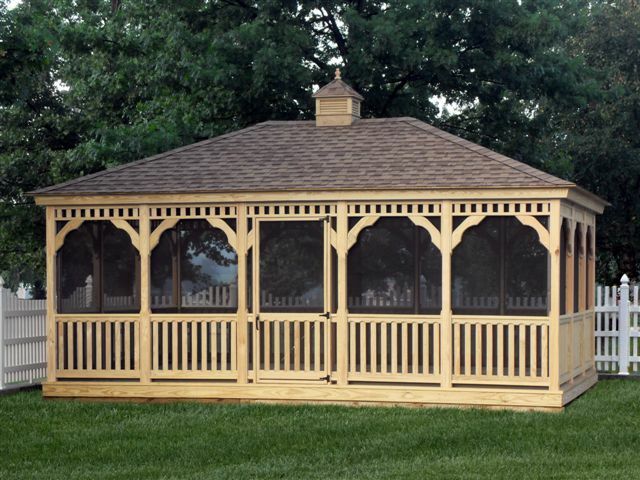 This Pavilion Gazebo pictured is an 18′ x 36′ with 2×3 Spindles, Double Roof, and Cedar Shingles. We ship the Pavilion Gazebo as a kit and assemble the gazebo on your site. All Pavilion Gazebos are too heavy and too wide & tall to ship pre-assembled. Call today for a quote! The Oval Gazebo can be built onsite if size is an issue. If you require roomy shelter, this gazebo is worthy of your consideration.The 12’x16′ vinyl gazebo featured has a Double Roof, Charcoal Shingles, and our Screen Package. This 20 ft. gazebo is customized with the Double Roof, Cedar Shingles and Screens. Join the ranks of satisfied customers who bought The Octagon Gazebo. The Octagon gazebo is our best-selling model and it gracefully improves the look of almost any home and yard. The gazebo featured is a 12 ft. wood Gazebo with charcoal architectural shingles. This Classic Gazebo is available in vinyl for maximum durability! Featuring a simplistic design, the rectangle allows you to maximize interior space without sacrificing the refined look of the exterior.